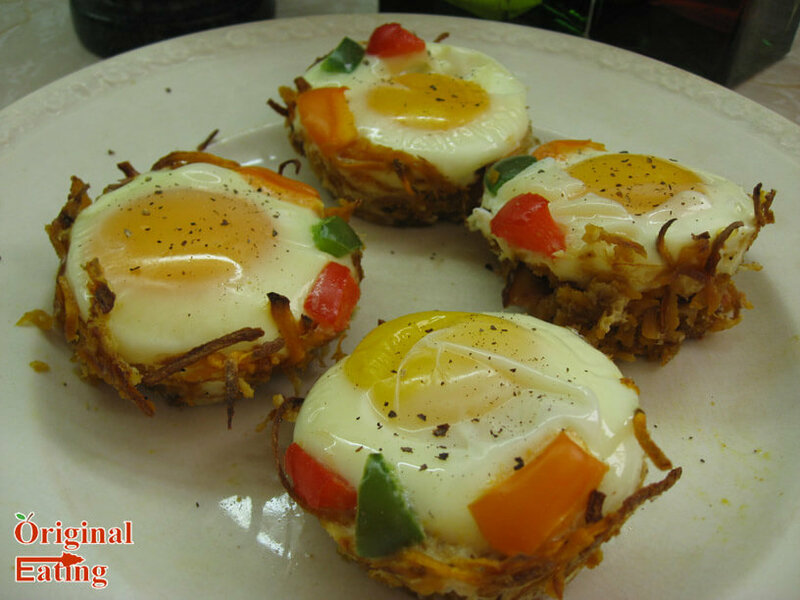 Cave Nests – for Valentine breakfast or brunch! With Valentine’s day coming around the corner, my mind has been on creating a very special breakfast for my family. I needed something with excellent presentation, as well as something kid-friendly. To me nothing beats creations that can be presented in individual portions. Not only does it give you an idea of exactly how much you’ve eaten, you can make sure the kiddos are getting their share too! 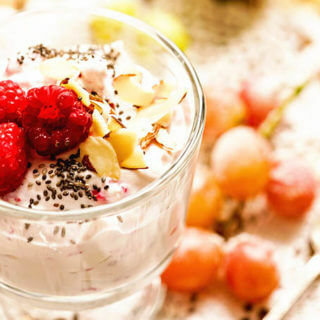 I also wanted something very well-rounded that would provide lots of delicious proteins to keep me full longer, along with some energy-providing carbs to help give me energy for the day. First, started my oven to preheat at 400° F and used olive oil to generously layer six muffin tin slots. Then, I grated one small sweet potato and mixed in a tablespoon of olive oil and salt and pepper. I recommend being pretty liberal with the salt and pepper in this step. It really helps to bring out the flavors of everything else we’ll put into the cave nests. Also I would suggest to bring the sides of the nest up much higher than I did here in this picture. The sweet potatoes will shrink down quite a bit more than you realize while cooking. I would also make the bottom of the nest quite thin. 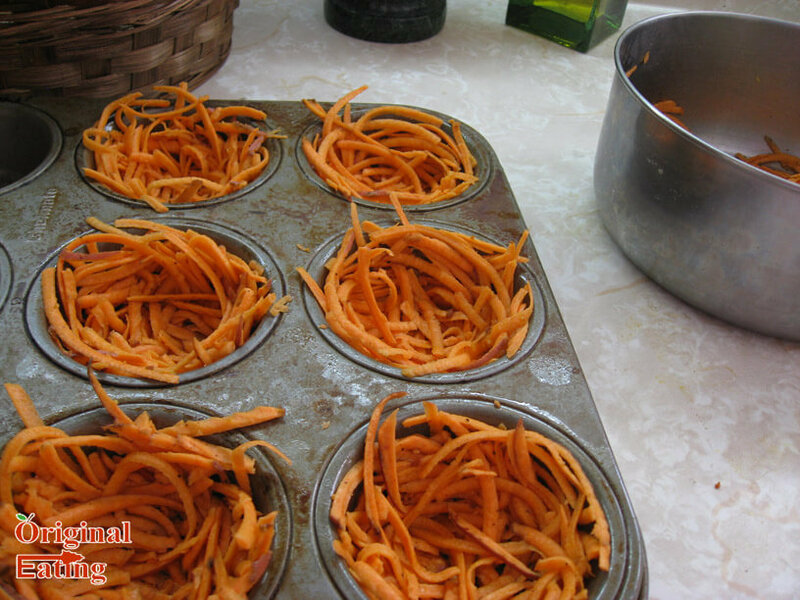 Then pop the sweet potato nests into the oven for about 12-15 minutes depending on the thickness of your nests. The tops will likely singe, so if they’re not cooked after this time don’t fret, we will be putting these back into the oven. While you’re waiting on your sweet potatoes, cook three pieces of bacon in the microwave. I always layer the bacon with paper towels above and below on a microwave-safe plate. Give them plenty of space and cook for 3 minutes. We want very crispy bacon, and this is what you’ll get with this method. Not to mention fuss-free. At this point I cut up with little pieces of vegetables I’d like to garnish my nests with. I use a very small amount of bell pepper with different colors for interest. 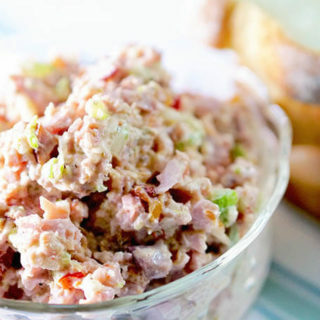 You can use onion, mushrooms, cherry tomatoes cut in half, or even some spicy peppers. The options are up to you. 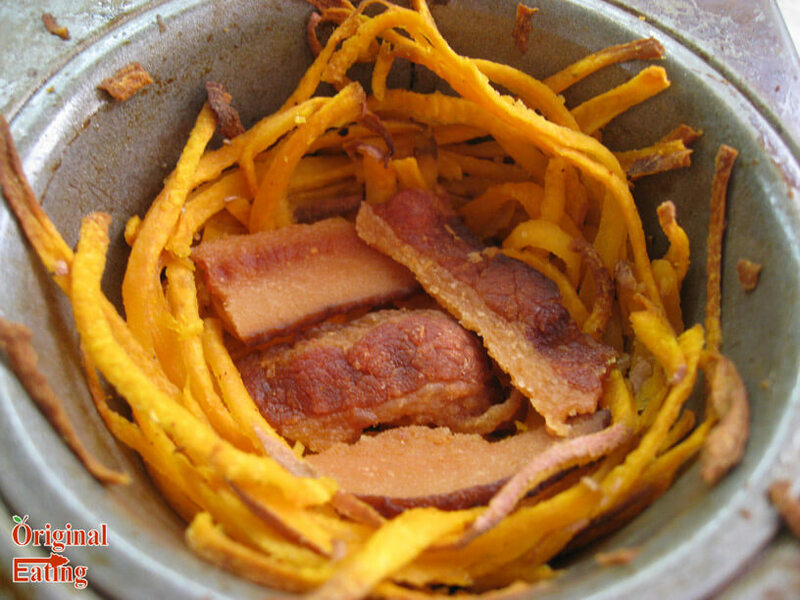 After the sweet potato nests have cooked, remove them and reduce the heat to 350° F. Layer the bottoms of the nests with the bacon. Then spoon in how ever much salsa you’d like in the next layer. I just used a half tea spoon and while it added flavor, it did not add too much heat. You can choose what level of intensity for your salsa that you like, but with my young children I just stick with mild. 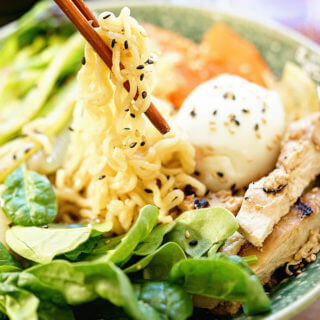 Next you crack in an egg per nest and pop in whatever vegetable garnishes you would like. I fancy that the different colors might be various eggs in my cave nest. You can get creative with story-telling with this breakfast with your children if you enjoy that sort of activity. Cook the cave nests for 15-20 minutes until all of the white in the egg is an opaque white. You won’t be able to tell how much your eggs have cooked by looking at the yolks. It will be very difficult to cook the yolks through without completely over-cooking the egg whites. I never thought I’d say this, but I actually enjoyed having soft egg yolks quite a bit with this dish. It gives the entire nest a fantastic flavor. If you’ve never tried eggs with soft or runny yolks before, I urge you to explore this! To pop the cave nests out of the muffin tins, I just used two butter knives. Run them along the perimeter of the tin, then use them both to pry it up and out. I didn’t have too much difficulty with this and trust me, I’m no acrobat. 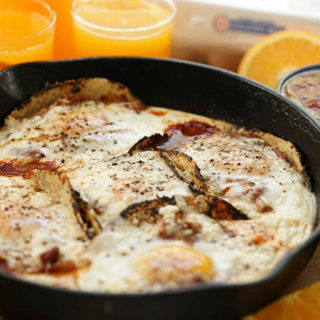 More great breakfast recipes to enjoy! 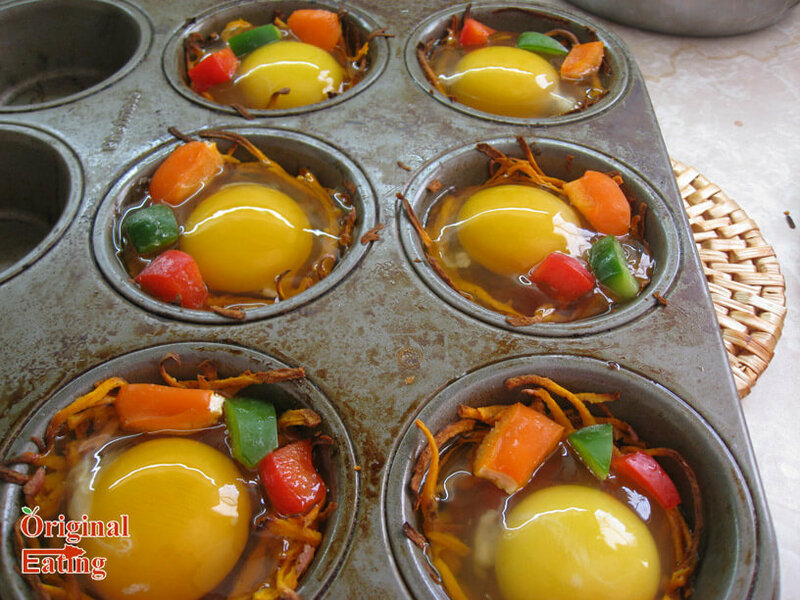 Preheat oven to 400° F, grease 6 muffin tins with oil. 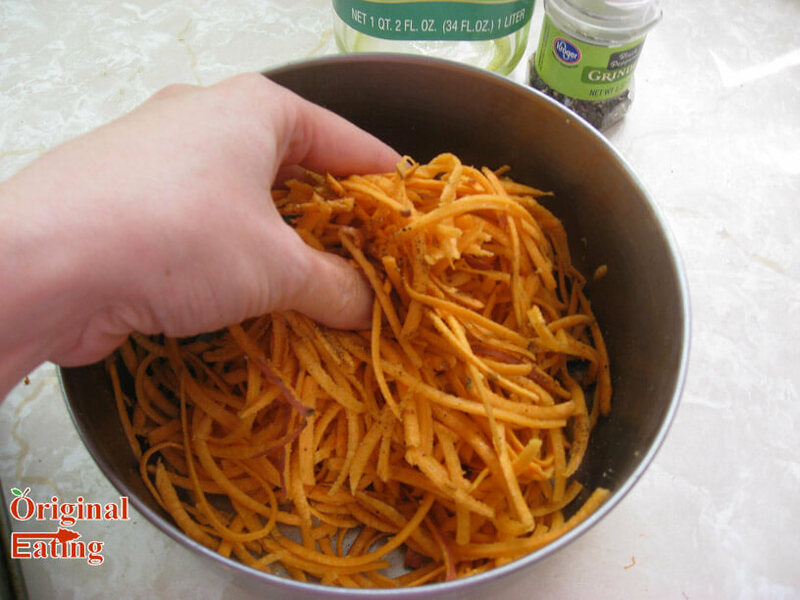 Grate sweet potato and mix in 2 tablespoons olive oil and salt and pepper well. Mix thoroughly. Line the potatoes along the walls of the tins, and thinly along the bottoms. Cook for 15 minutes. 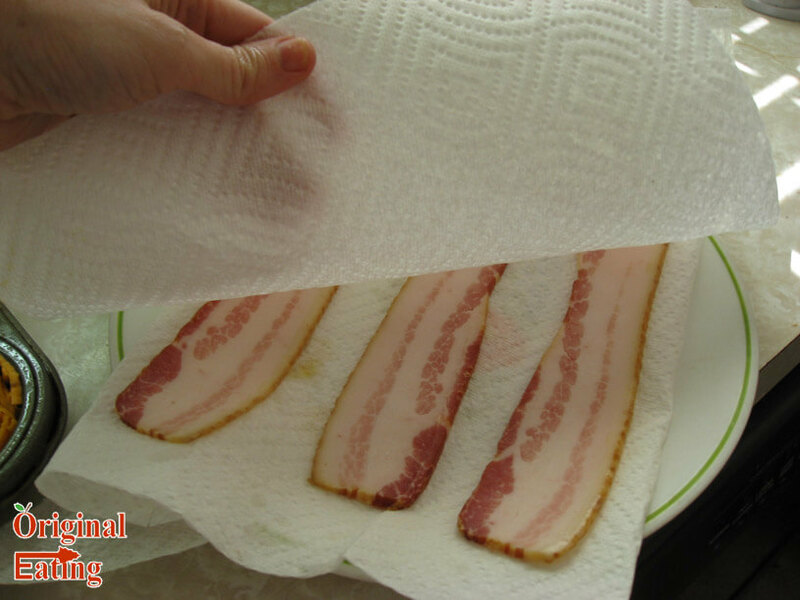 Meanwhile, layer bacon with paper towels on a microwave-safe plate and microwave on high for 3 minutes. Prepare garnish vegetables as desired. 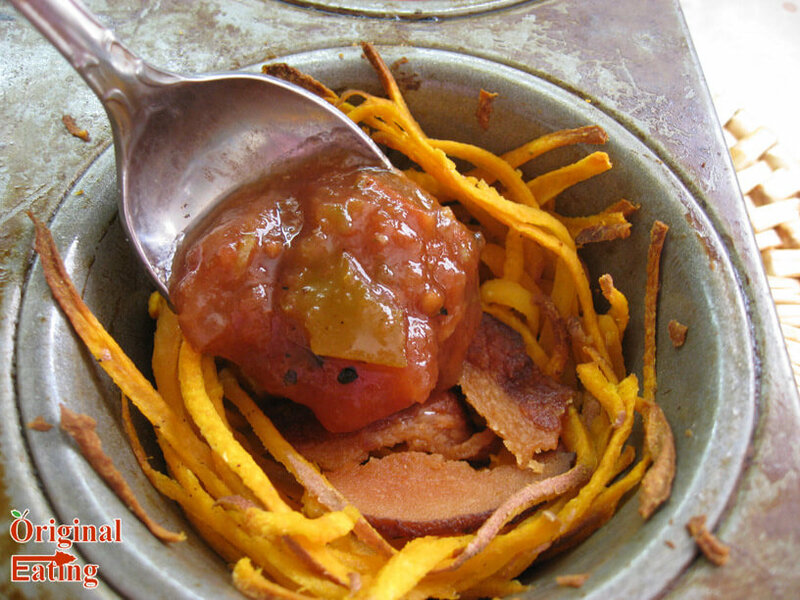 Remove sweet potato nests and reduce heat to 350° F. Layer each cave nest with bacon, then a teaspoon of salsa, then one egg per nest. Add vegetable garnishes as desired and cook for 15-20 minutes until egg white is opaque. Salt and pepper as desired. Stephanie Stuart is the creator of Original Eating, which is a highly-successful Paleo diet and nutrition site. She has been enthusiastic about the natural health industry combined with positive motivation for over ten years. She has years of experience in the field of personal development, nutrition, and herbal healing. She is the author of several books focusing on healing the body with Paleo foods and herbs including 7-Day Jump Start to Positively Paleo, and Paleo Weight-Loss 7-Day Jump Start. She has worked with people for over a decade to help them discover a more healthy way of living. Stephanie also wrote and published the book Unlocked! The Ultimate Paleo Diet Guide, which explains in plain English how and why the Paleo diet works and how to get the greatest benefits for your needs. She has also created several recipe books, many courses and information products, and articles that have been published online. After the birth of her first child, she used techniques she formulated herself to lose weight and get back on track with life both physically and emotionally. A second baby and years later, she still maintains a healthy and positive lifestyle while continuing to write to help share her information with others. She currently spends her time with her family in the United States where she enjoys teaching her children, studies nutrition, peaceful nature walks, and making inventive crafts. If you’d like to BE SURE you don’t miss out on all the great content, you should hop on the newsletter list! Curious about what foods are allowed on the Paleo diet? 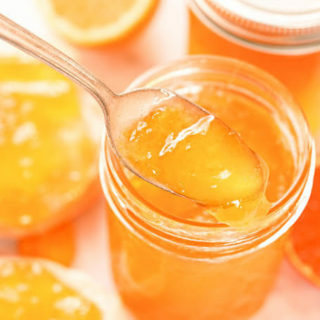 Check out the Paleo diet food list, or even take a look at the delicious Paleo diet recipes page. 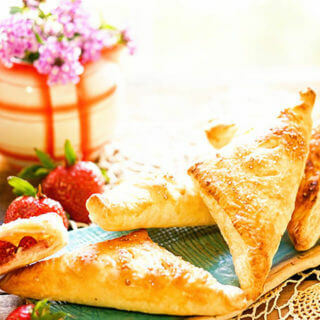 Thank you for the opportunity to post a recipe on your wonderful blog! I am honored to work with you and I hope to work with you many times! As am I – I certainly appreciate the camaraderie and the opportunity to work together!